3D will first enter homes though Sony's PlayStation 3, but Nintendo could use it in the Wii's successor as well. Nintendo's next handheld, the aptly named 3DS, is already a venture into the world of 3D eye-popping graphics, but the Wii will still remain non-3D for now. That doesn't mean Nintendo boss Satoru Iwata isn't thinking about it for future consoles. Speaking to Nihon Keizai Shimbun (via Andriasang), Iwata denied any updates to the Wii that would add 3D functionality. "If you display a 3D image, the image quality becomes extremely bad, so we'd probably do it with the next system," he said. "We're thinking that the timing should be once the 3D television adoption rates crosses the 30% mark. We're looking at the adoption trends." Iwata believes that 3D is an important evolution of gaming in general. He also said: "In 3D, it's easier to get a sense for position. In a game where the stages extend into the screen, it's surprisingly easier to control [compared to non 3D]. This is functionality for making games more pleasant to play, not just for show." "It allows us to realize images that are close to what you see in your daily life. In the future, 3D will become the mainstream of gaming," he predicted. 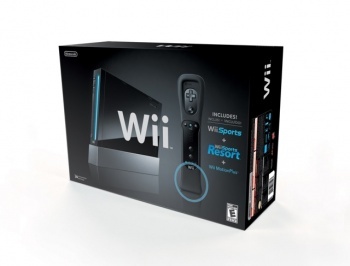 Does this mean the Wii 2 could combine motion gaming and 3D? That might make all of our heads explode. Along with Sony's major focus on 3D movies and PlayStation 3 games, it looks like 3D is gaming's future even though consumers, or perhaps at least those that follow the industry regularly, have been inundated to the point where it's almost sickening yet most of us haven't even experienced a single game in 3D yet. There is a possible danger in this that can be exemplified by the release of the Nintendo DS, for which many developers (Nintendo included) shoehorned touchscreen controls into games where they weren't necessary. This is mirrored by some of the titles developed for the Wii and the PlayStation 3 that used motion control "just because," sometimes totally marring the experience such as with the PS3's Lair. I'm all for new ways to play, but only when they improve on the past, not when they destroy what works completely fine as is. I would prefer a developer spend time on making a deeper experience, rather than better 3D graphics. I don't think I'm being an old man annoyed at passing horseless carriages here, as the 3DS alone looks quite amazing and I would pre-order one today if I could, but I just want to try this stuff out already.